WeatherTiger’s first look at the 2019 hurricane season is for near even chances of an above, below, or near normal year. The median of our forecast is about 105% of average hurricane season activity, or around seven hurricanes and three major hurricanes. This is slightly more aggressive than some other recently issued forecasts, likely due to our model’s skepticism towards the ongoing El Niño. Overall, model skill is very limited at this range, and all April hurricane seasonal outlooks should be regarded as low-confidence forecasts. Allergy season is still clogging our collective sinuses with beaucoup pollen, but that nettlesome phalanx of airborne gamete delivery systems also means hurricane season is just around the corner. Immense hurricane fatigue notwithstanding, the June 1st start of the official 2019 season is less than two months away, and several forecast groups have released opening bid seasonal predictions in the last week. 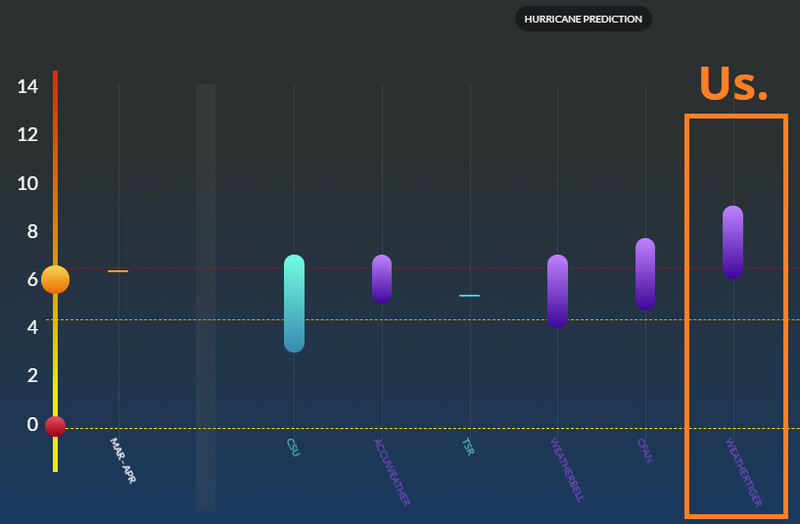 These public released forecasts, including WeatherTiger’s, can be compared directly at seasonalhurricanepredictions.org, which will continue to update projections through mid-August. Early forecasts divide into two general camps. On one hand, some established groups like Colorado State University and Tropical Storm Risk are projecting slightly higher chances of a less active season. These forecasters predict a most likely outcome of around 80% of typical total storm activity, around five hurricanes and two major hurricanes. The rationale behind these forecasts is relatively straightforward. NOAA officially declared the onset of an El Niño in mid-February, and these modestly warmer than average waters in the Equatorial Pacific Ocean are likely to persist into the summer. El Niños are linked with storm-weakening wind shear in the Atlantic, so El Niño years tend to have quieter hurricane seasons. Current sea surface temperature anomalies closer to home are also not particularly alarming, with near normal or cooler than average waters in the Tropical Atlantic’s Main Development Region. Taken together, these mitigating factors underpin Colorado State’s and Tropical Storm Risk’s relatively calmer forecasts. However, there are potential issues with this reasoning. Spring projections for El Niño face a “predictability barrier” of diminished long-range forecast skill, and sudden shifts in the Pacific at this time of year can mercilessly punk a seasonal forecast. In 2017, most spring hurricane outlooks (but not ours!) called for a well below average season and failed spectacularly due an anticipated strong El Niño’s failure to launch. A second cluster of early forecasts for 2019, mostly issued by private companies, is projecting a near or incrementally above normal season. WeatherTiger’s proprietary forecast algorithm is among these, with a most likely outcome centered on 105% of average activity, or seven hurricanes and three major hurricanes. We can’t speak for all the forecasts in this camp, but our methodology is skeptical that El Niño will exercise a robust suppressing influence on the 2019 hurricane season. The warmest waters relative to normal in this El Niño are in the central, rather than eastern Pacific Ocean. This unusual flavor of El Niño historically has had a less negative impact on Atlantic hurricane seasons than the traditional, east-based events. Additionally, our model shows a drift towards more Niño-neutral conditions by summer. WeatherTiger’s algorithm also notes the current presence of tepid Main Development Region waters, but balances this against some leading indicators that auger Atlantic SST patterns may become less unfavorable before the peak of hurricane season in the late summer and early fall. Our analytics see the warm and wet winter in western Africa and the eastern Equatorial Atlantic as a predictor of warmer Atlantic summer and fall SSTs. 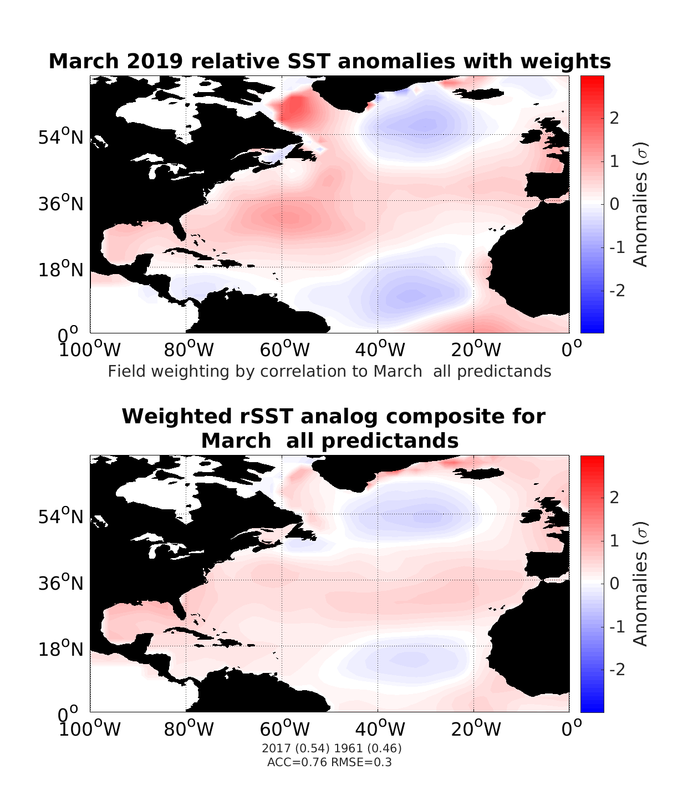 Strangely, the two best North Atlantic analog years to March 2019 are March 2017 & March 1961– which both went on to be hyperactive years following innocuous spring Atlantic SST patterns. Of course, the Pacific was radically different in those years, so I’m not at all arguing that’s where we’re heading. But those having those two years in the mix as top spring analogs for the Atlantic should certainly give pause to anyone who would dismiss 2019 out-of-hand at this lead time. Overall, a key caveat when assessing seasonal hurricane forecasts is to consider the historical skill of the prediction. In other words, not all forecast sources provide any evidence they work, and a dirty secret of projections issued in April is that many groups have zero or negative skill over the past decade-plus of forecasts. Negative skill means an annual guess of exactly average has lower net error than the actual predictions. WeatherTiger’s algorithm performs stringent backtests on over three decades of hurricane predictions, but to be transparent, even our April forecasts only squeeze out modest skill over climatology at this range (see below). Because of this, there is a massive uncertainty interval around our April projection, with a 50% chance of total activity falling between 65% and 160% of normal this year. Objectively, we find the odds of a below normal, normal, and above normal season to be roughly 35%, 30%, and 35%, respectively. In other words, all possibilities remain, well, possible. So, will it be an active hurricane season? To quote the estimable Magic 8-Ball, ask again later. The bottom line regarding April seasonal forecasting is that occasionally there are spring pattern signals so strong that hurricane season odds actually do tilt one way or another. However, 2019 is not one of those years, and our model’s even-chances forecast reflects this inherent uncertainty. We’ll be back with our traditional deep dive seasonal forecast on June 5th, by which time forecast skill begins to slowly increase and we’ll break out our landfall odds. Until then, keep watching the skies. Dr. Ryan Truchelut is co-founder and chief meteorologist at WeatherTiger, a start-up providing customized seasonal forecast solutions and weather consulting for commodity markets, government, and private enterprise. Get in touch at ryan@weathertiger.com or find out more at weathertiger.com to find out how to put our trusted expertise to work for you. Click here to sign up for our Hurricane Forecasting subscription service to have all of WeatherTiger’s seasonal hurricane outlooks, weekly tropical video discussions (June-October), and individual storm forecasts sent right to your inbox as soon as they are released- still a great value at just $50/year!